It was around this time of year several decades ago that my father began a conversation with me about my future. I was a high school junior, and like many high schoolers, I had vague plans about traveling, eventually getting through college, and then doing just whatever might come my way. That’s when he talked to me about joining the military. He had been in the Army by that point almost twenty years. As upperclassmen in high school, we were by then being approached by recruiters from each of the services to talk about joining up. Knowing me better than the recruiters, my father wanted to guide me in a direction that might interest me. I joined when I was seventeen, and I left for basic training two weeks out of high school. That was well over twenty years ago. Had I stayed in, I’d be “retired” now – or at least eligible for retirement. That blows my mind, because I certainly don’t consider myself anywhere near “retirement” age. By not staying in a full 20 years, it turns out that I was in the majority. Only 17% of those who serve in the military go on to “retire,” according to a report compiled by the Defense Business Board (DBB) in 2011. More importantly, the DBB report detailed how woefully underfunded the military pension system is for those who do remain in the military for more than 20 years. The full report can be accessed here, with the chart above available on slide 20. And the unfunded liabilities noted in the audit were calculated using an assumed interest rate of 4.6% — over two percentage points above the current rate of the U.S. Treasury 10-year note. This is important because as the audit explains, regulations set by the Federal Accounting Standards Advisory Board (FASAB) “requires the use of a yield curve based on marketable U.S. Treasury securities to determine the interest rates used to calculate actuarial liabilities for federal financial statements.” The 4.6% rate is well above the interest rate of “marketable U.S. Treasury securities,” as those who invest in the G Fund know all too well. The reason for the higher rate is simple, even if it is currently demonstrably above realistic yield curves. 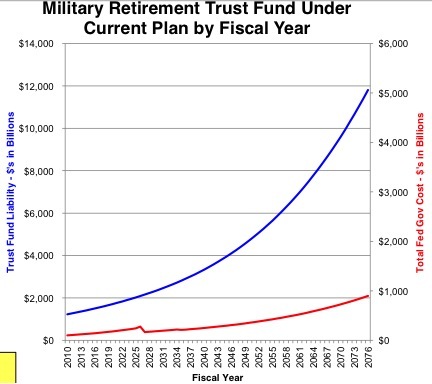 The lower the rate, the higher the future liabilities for the military retirement trust fund, because the lower rates don’t earn as much interest over time as a higher rate. Using a more realistic interest rate of around 2% would increase the unfunded liabilities even further. Maintaining a higher yield curve reduces unfunded liabilities. U.S. corporations, by the way, are facing the same pressures. Ford recently had to lower its discount rate to 3.84% from 4.6%, but this “created a bigger liability on its balance sheet,” according to a recent report in the Wall Street Journal on unfunded liabilities in corporate pension plans. With trillion dollar budget deficits, will this situation solve itself? I don’t think so. As the DBB study states, “the retirement plan is unaffordable,” “unfair,” and “inflexible” because it vests only after 20 years of service. That’s why only 17% of service members ultimately end up collecting a pension. While the report only tangentially touched on the issue, it pointed to the possibility that a service member could retire at the age of 40 and collect a pension for the next 60 or more years – more than three times the 20 or so years of service that individual performed. It is sort of like the story last year detailing how the U.S. Government still pays two civil war pensions. The last Civil War veteran died in 1956 at the age of 109, and the last widow died in 2003, while two unnamed children of Civil War veterans continued to collect a pension benefit almost 150 years after the war itself ended. These are just anecdotes now, but with advances in medical technology, anecdotes will become regular occurrences. Many of us will be living into our 100s, and our great-grandchildren will be on the hook to pay those pensions. Hence the DBB’s recommendations. It recommended a “new defined contribution plan” (slide 12) that would include government-provided annual contributions to the TSP, with potentially greater contributions for personnel at risk (eg, in war zones) or on hardship tours. Disabled participants would qualify for an immediate pension formulated with VA benefits as presently structured. The study briefly discussed more limited annuities or “cash balance” plans (somewhat along the lines of this discussion) but the main recommendation was to switch to a defined contribution plan. Of course, these recommendations ignore the findings from another DoD study that determined matching or extra payments to the TSP does little to enhance recruitment and retention. Attitudes might be changing on this, especially as younger service members return from multiple combat tours and start to think of life outside of the military while they are still young. Regardless, the incredible fiscal pressures together with increasing lifespans – and the inequitable vesting of the military pension plan – point to the need to reform the system. In all of these types of reform recommendations, the TSP is the one component that remains unscathed.